Is your Fort Point property or residential building subject to changes in the Federal Emergency Management Agency (FEMA) Flood Insurance Rate Maps (FIRMs) effective March 16, 2016? To discover and prepare for flood zone changes, FEMA, the Massachusetts Department of Conservation and Recreation and the City of Boston Environment Department will have representatives at local civic meetings to provide assistance to people with further questions about the changes, including additional information about flood zones, personal assistance with reading the Flood Insurance Rate Maps (FIRMs), and available options to mitigate the impact of those changes. FEMA Corps representatives attended the Fort Point Neighborhood Association's (FPNA) January 27th neighborhood meeting and will return to answer questions at FPNA's February 23d meeting from 6pm - 8pm at Factory 63. Call a FEMA Insurance Specialist to discuss insurance options at 1-888-379-9531. Massachusetts School Building Authority: Mayor Walsh filed statements of interests for repair cost reimbursement for the following schools: West Roxbury Education Complex, Jackson-Mann K-8 in Allston, McCormack Middle School in Dorchester, Dever Elementary in Dorchester, Boston Latin School in Fenway, Channing Elementary in Hyde Park, and the Condon School in South Boston. The matters were assigned to the Ways & Means Committee for a hearing. Hubway Grant: The Council voted to authorize a grant in accordance with Councilor McCarthy’s recommendation that would fund Hubway bike share stations in Brighton ($95,600 from the Boston College Neighborhood Improvement Fund). Councilor McCarthy and Councilor Ciommo both stated that Hubway needed to have better communications with the City and Councilors about the placement of stations, because the Council is committed to supporting multi-modal transportation but placing the stations without community feedback can lead to unintended traffic and safety issues. Landmarks Designation: The Boston Landmarks Commission filed for Council approval on two new designations: the Winthrop-Carter Building (1 Water Street, downtown) and the Alvah Kitterage House (10 Linwood Street, Roxbury). These would automatically take effect on February 12, 2016 if no vote takes place. The matters were assigned to the Committee on Planning & Development for a hearing. Pay Equity Resolution: The Council voted unanimously to suspend and pass Councilor Pressley’s resolution supporting state legislation to establish pay equity (S.2107/H.1733). The legislation would amend the current Massachusetts Equal Pay Act to include provisions that would allow employees to discuss compensation among co-workers, prohibit employers from inquiring about previous compensation in the interview process, and create a standard for internal review for businesses to ensure compensation is in accordance with industry standards. In the US, women working full-time earn 79% of what men earn. Black women working full-time earn 68% of what men earn, and Latina women earn 54%. Income Inequality: Councilor Pressley filed a hearing order to discuss how to reduce income inequality in Boston and identify best practices for economic mobility, workforce development, asset building, and retention. She noted that the order was in response to the Brookings Institute’s recent study that found Boston was the city with the greatest income inequality in the country. The matter was sent to the Committee on Jobs, Wages & Workforce Development. Special Education Equitable Transitions: Councilor Pressley called for a hearing to review the FY17 BPS special education budget and identify solutions to ensure equitable transitions of BPS youth as they graduate or age out of BPS. Councilor Jackson noted that he appreciated the focus on the BPS budget, as he doesn’t believe the increases to the budget this year are sufficient, given that they don’t match inflation. The matter was assigned to the Education Committee for a hearing. Urban Renewal: Councilor Linehan filed for a working session on the Urban Renewal Plan and process from the Boston Redevelopment Authority. The BRA’s urban renewal powers are set to expire in April 2016, and the agency has been seeking a 10-year renewal of their existing powers, which would require Council approval and approval from the state’s Department of Housing and Community Development. The matter was sent to the Planning & Development Committee for a hearing. Sister Cities: Councilor Flaherty called for a hearing on Boston’s Sister Cities program. He noted that Boston currently has ten sister cities around the world, allowing the city to develop educational, cultural, and economic ties, which are crucial to remaining a global leader in innovation. The matter was sent to the Committee on Arts, Culture & Special Events for a hearing. Open Meeting Law Complaint: The Council voted to pass my order designating the City’s Corporation Counsel as our respondent for the Open Meeting Law complaint filed against the City Council by Shirley Kressel. Councilor Wu filed the order to comply with the state Open Meeting Law and the Attorney General’s regulations, which require that any legislative body that receives a complaint acknowledge it at a public meeting of the body and designate a respondent. The substance of the complaint deals with the Council’s December 9, 2015 vote to approve transfer of the Winthrop Square Garage to the Public Facilities Commission. For complete an prior Boston City Council meeting notes, visit MichelleForBoston.com or sign up to receive these notes automatically each week by email. 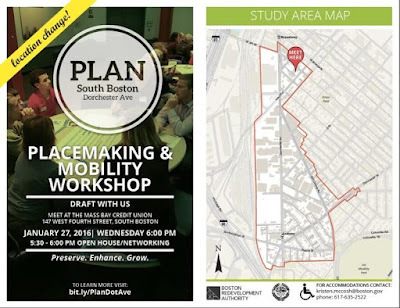 Join the Boston Redevelopment Authority on Wednesday, January 27, 2016 from 5:30 - 6:00 PM for networking and an open house on the Dorchester Avenue Corridor Plan. Then from 6:00 - 8:00 PM participate in a Placemaking and Mobility workshop, which will focus on the future character of the study area and various components of the emerging plan. The meeting will take place at the Mass Bay Credit Union located at 147 West Fourth St in South Boston. This is the sixth workshop of the Dorchester Avenue Corridor planning process. More details on the Dot Ave Corridor Plan. Fort Point neighbors came together at a recent Fort Point Neighborhood Association (FPNA) meeting to prepare questions for FPNA's upcoming neighborhood meeting with the Boston Grand Prix on January 26th from 6 pm - 8 pm at the Boston Children's Museum. The list of questions generated were provided to IndyCar Boston last week and are published below. necessary accommodations for those of us living and working in Fort Point. If you have not yet registered to meeting, please click here. Registration is required for admission. What is the status of agreements and permits following Letter of Intent (12/18/15)? ➢ What is the permit process timeline? Will Fort Point residents, guest and clients be guaranteed 24/7 access to residential buildings, parking garages & on street residential parking? Sleeper St. from Congress to Seaport Blvd. ➢ What is the maximum noise level during practices and races? ➢ What is the noise level from spectators, vendors and special events (i.e. concerts)? ➢ What noise safety precautions will be employed? ➢ What is duration from start to finish? ➢ Will there be night and weekend work? ➢ What are the hours & days? ➢ Where is the lay down or marshalling area(s)? ➢ Who do we contact in case of problems, especially after hours? ➢ What are the specific roads/intersections and closure duration (hours/days)? ➢ Will road closures limit access to public and residential parking? ➢ Will there be access to Interstate 90 & 93 on/off ramps on Congress Street? ➢ Will there be access to the Ted Williams tunnel to Logan Airport? ➢ Will there be emergency access and a clear evacuation route? ➢ What will be the truck alternate routes from the South Boston Bypass Road/Haul Road, including trucks from the Marine Industrial Park, Gillette, and USPS? ➢ Will there be interruptions to the Silver Line route & schedule? If so, what times & days? ➢What will be the impact on traffic on already busy streets like Congress & A Streets? ➢ What days/hours will access be restricted to South Boston Bypass Rd, West Service Rd. and Congress from W. Service into the Seaport? ➢ Given the poor condition of Cypher St, what upgrades are required to make it safe to include in the race course? ➢ What upgrades are required to make the other course roads safe for auto racing? Please provide race course map displaying neighborhood streets and residential buildings in proximity to race course, grandstand viewing areas, television camera platforms, television and media production locations, safety runoffs,crew pits, etc. for presentation and as handouts for distribution. ➢ Has the race course changed since September 22, 2015? ➢ Where are the public access points/gates/grandstands/hospitality suites etc…? ➢ Where will the broadcast/media and related parking be located? ➢ Where are the grandstands, hospitality suites, sanitary facilities going to be set up? ➢ Will the Gillette & USPS parking lots along A Street be used for parking, spectator hospitality/ Fan Fest Tents, pre-event construction, sanitary facilities, etc…? ➢ What are the height and length of each grandstand? ➢ What is the volume (number of seats) for each grandstand and total number of seats? ➢ What other spectator viewing areas are planned? ➢ What materials will be used to create runoffs? ➢ What is the placement of the crew pits and runoffs? ➢ What is the length of the crew pits and runoffs? ➢ What elevation changes are needed to create pits given current conditions? ➢ Will there be road closures to accommodate the construction of the runoffs and crew pits? If so, what is the duration? ➢ How tall are the jersey barriers and safety fencing? ➢ Will there be unrestricted access to sidewalks? ➢ Will there be unrestricted access to bike lanes? ➢ Will there be restrictions to walk & bike ability in and around Fort Point? What is the Trash removal plan and schedule for ? ➢ What is the Terrorism Prevention & Emergency Management Plan? ➢ How will you restrict the public from entering residential buildings adjacent to track and viewing areas? ➢ What about the protection of green spaces, landscapes, buildings and cars? ➢ What is the plan? ➢ Who is paying for additional local and state law enforcement? Insurance: If the public gets hurt or there is building damage on/to a commercial or residential property adjacent to track or viewing area, will the Boston Grand Prix's liability insurance cover it? Local Community Benefits: What are the benefits to Fort Point South Boston community? Appointments: Mayor Walsh filed notice of two Boston School Committee appointments, Alexandra Oliver-Davila (new appointee) and Miren Uriarte (reappointment) until January 2020. FY15 Comprehensive Annual Financial Report: The Council received notice from the City Auditor Sally Glora that the City’s Comprehensive Annual Financial Report & Basic Financial Statements for Fiscal 2015 have been filed. You can see these online. Unfair Commuter Rail Fares: Councilors McCarthy & Wu refiled our order for a hearing on inconsistencies in Commuter Rail fares across Boston. The MBTA draws a line between Zone 1A and Zone 1 stops, with a significant fare increase from $2.10 to $5.75 across that arbitrary border. Roslindale is just outside Zone 1A, so residents pay significantly more than residents in some towns outside Boston that fall in Zone 1A. Councilor McCarthy had noted the impacts on parking, with residents driving across these zone lines, parking their cars in overcrowded MBTA lots and spilling over into the surrounding neighborhood. Several colleagues noted that this is an issue of fairness, and all of Boston should have access to the lower commuter rail fare. The matter was assigned to the Committee on Parks, Recreation & Transportation for a hearing. Snow Removal Exemptions: Councilor Jackson filed an ordinance that would create an exemption for residents over 60 years old and disabled residents from the City’s snow removal rules. Currently, the City requires all homeowners to shovel the sidewalk in front of their home within 3 hours of snowfall, with a $50/day fine for non-compliance. Councilor Jackson noted that the City’s website specifically encourages senior citizens to avoid shoveling, but the rules force elderly and disabled residents to choose between health risks and monetary fines. The proposed ordinance would allow seniors over 60 years old and persons with disabilities to apply for exemption through an “opt-in” process. Several Councilors noted that while we do need to protect the health and well-being of residents, the City must have a fail-safe way to ensure accessibility in winter with cleared sidewalks. The matter was sent to the Committee on Government Operations for a hearing. Alcohol Tax: Councilors Linehan & Baker refiled their home rule petition from last term to impose a tax on alcohol sales that would fund addiction treatment and recovery programs. The proposed law would cover alcohol sales at both off-premises and on-premises businesses (e.g. at restaurants) and would be a 2% tax. Councilor Linehan estimated that this would provide ~$10M annually for programs to address the urgent issue of addiction treatment and recovery. Councilor Baker said that although his preference would not be to burden small businesses, he believed we need a statewide tax to provide funding streams for the important policies that our Governor and Mayor support. The matter was sent to the Government Operations Committee for a hearing. Boston.gov Redesign: This morning, City Councilors & staff met with members of the Department of Innovation & Technology to give feedback on the City’s website redesign. The new site, which is expected to roll out this summer, will organize information by Topics rather than by City Department, aiming for a more intuitive match with residents’ needs. To see the mockup and give feedback, visit https://pilot.boston.gov. You may also sign up to receive the Boston City Council newsletter. 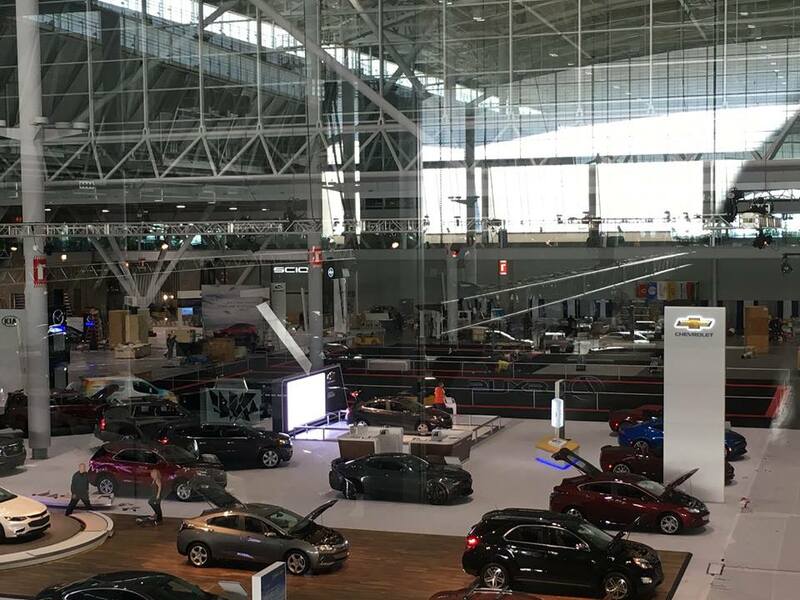 The New England International Auto Show is a five day event (Jan 14 - 18) that is expected to draw thousands of attendees from the Greater Boston region and elsewhere in Massachusetts. The Boston RV & Camping Expo is a three day event happening at the same time as the last three days (the weekend days) of the New England International Auto Show. Attendees for both events are expected to come by personal vehicle, taxi, or public transportation to come to the event. As in years past, these two are expected to be very busy drive-in events with several hours of steady traffic coming into the BCEC in the early morning of each weekend day. Attendees directed to overflow will be given maps and directions to the respective overflow location. Transportation agents will be on site to make sure shuttle buses, taxis, and test cars do not impede other traffic on the driveways or stop at locations that will cause safety concerns for the passengers and/ or other motorists. Use portable variable message signs (PVMS) to guide attendees quickly off the street and into BCEC parking lot. PVMS signs will be various locations including Summer Street @ D Street facing Downtown and A Street @ Necco Street facing South. Boston Transportation Department Staff and Boston Police will be on hand to facilitate traffic. The MLK Breakfast is scheduled to take place during the morning of Monday, January 18, the last day of the New England International Auto Show and the Boston RV & Camping Expo. As in past years, the MCCA Transportation Department will provide extra staff coverage and make sure that this small event does not significantly impact the two larger events. In past years, there were no issues involved. updated 1/14/15 to include the Yotel Hotel. harder to keep your New Year's resolutions. If you got an electric car, you are in luck. Properties in Suffolk County, which includes Fort Point and South Boston, maybe subject to changes in the the Federal Emergency Management Agency (FEMA) Flood Insurance Rate Maps effective March 16, 2016. The Open House will provide assistance to people with further questions about the changes including additional information about flood zones, personal assistance with the reading of the Flood Insurance Rate Maps and available options to mitigate the impact of these changes. FEMA has made a provision for property owners who obtain flood insurance prior to the rate increase on March 16th, whereas they will be grandfathered in at the existing tier rate. sources: Important Public Notice form the City of Boston Environmental Department and DCR Massachusetts, The Boston Harbor Association and FPNA Special Edition Meeting January 6, 2016. By City Charter, City Council terms expire at 10AM on the 1st Monday of January after each municipal election, so returning and new Councilors are sworn in then. The first Council meeting of the term takes place at 12PM on that 1st Monday of the year, where the main business is to elect a new City Council President. The most senior member of the Council (defined by age, not years in office) presides over the meeting until the new President is elected. That meant that yesterday Bill Linehan (who just turned 65) held the gavel until the newly elected President, Michele Wu, took over. Council Rules: City Council voted to pass the 2014-2015 City Council rules (except for Rule 36, Council Committees) as temporary rules until permanent rules are adopted for the new term. The Rules define our procedures and organization, outlining the different Council Committees and respective areas of oversight. Council President: Councilor-At-Large Michele Wu was elected City Council President by a unanimous vote, and took the gavel from Councilor Linehan at this point in the meeting. President Wu spoke for a few minutes about goals for the next term - transparency and accessibility first and foremost. City Council will also dive in on major policy areas that came out of conversations with fellow Councillors over the last few weeks: reducing income inequality, reforming our criminal justice system, improving educational opportunities, and preparing for climate change. City Council was then honored to have Mayor Walsh and Senator Elizabeth Warren address them. Detective Joe Gallant Foundation Grant: As requested by Councilor McCarthy, City Council voted to suspend and pass a $10K grant for the Detective Joe Gallant Foundation to support the Family Justice Center. Zoning Commission: Mayor Walsh filed to appoint Jeanne Levesque to the Zoning Commission until Nov. 2018. This was sent to the Committee of the Whole until new committees are voted on. Residency Policy Commission: City Council received notification that the Commission filed a report, which was sent to the Committee of the Whole. Diversity in Post-secondary Institutions: Councilor Jackson filed for a hearing to continue his discussions on diversity in post-secondary institutions. This was sent to the Committee of the Whole. Finally, the meeting concluded with a moment of silence for Howard Leibowitz, Linda Walczak, and Mike Mullane - three individuals we lost at the end of 2015 who contributed immensely to the city in their respective fields. For prior Boston City Council meeting notes, visit MichelleForBoston.com or sign up to receive these notes automatically each week by email. The South Boston Bypass Road (SBBR) and High Occupancy Vehicles (HOV) Lanes Pilot Program that began in August is scheduled to end February 19, 2016. The pilot program originated from recommendations made during the South Boston Waterfront Sustainable Transportation Plan process. Massachusetts State Police will be strictly enforcing restrictions on the SBBR. Failure to comply may result in a moving violation and a fine of $50 per infraction. An analysis will follow after the Pilot Program to determine what, if any, further actions may be taken. Traffic monitoring checkpoints occurred in Sept/Oct and December 2015. The post pilot program evaluation is due March 2016.